"The Book of Mormon" creators Matt Stone, left, and Trey Parker. 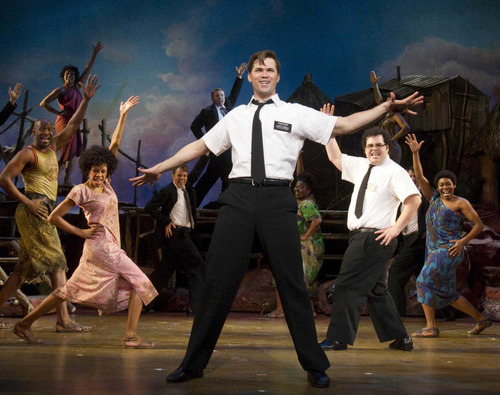 The Associated Press file photo Andrew Rannells, center, performs with an ensemble cast in "The Book of Mormon." The musical will be opening in denver four months earlier than had previously been announced. CD • Now comes the cast recording of "The Book of Mormon" musical, available for download today before the CD hits stores June 7. "South Park" creators Trey Parker and Matt Stone collaborated with Broadway composers Marc Shaiman ("Hairspray"), and Robert Lopez ( co-composer and co-lyricist of "Avenue Q"). And it shows, as the music features traditional Broadway arrangements, mixed with sanitized elements of African music and rock. "Jersey Boys" veteran Andrew Rannells (as Elder Price) and "The 25th Annual Putnam County Spelling Bee" vet Josh Gad (Elder Cunningham) offer full-throated vocals. The lyrics are clever, slightly scandalous, and of great interest to local audiences. What's most offensive about "The Book of Mormon" score is that music is often dull and, worst of all, derivative within the musical theater genre.